Indian Superfood is based on the unique concept of bringing together our love for the nation’s favourite Indian food, with superfoods and superspices – foods and spices recognised for their health-promoting and medicinal properties, beyond the basic nutritional function. The book employs these superfoods and superspices to create recipes that are original, and developed keeping this fresh and distinct concept in mind. It makes use of exotic mushrooms that are hailed for their anti-viral and anti-cancer properties, and goji berries, for enhancing the immune system function. Amongst the superspices used are chilli, celebrated for its role in reducing arthritic pain and shrinking cancerous tumours, cinnamon for its anti-bacterial and anti-viral effects, and garlic for its role in preventing heart diseases. There are aromatic superfood alternatives to restaurant classics such as Chicken Madras, using banana and fenugreek that will aid the body’s muscle-building and digestive processes. You will also find a superfood version of lamb saag, ‘choy sum lamb’, where the choy sum leaves help guard against the occurrence of blindness. A book based on cooking with superfoods would be incomplete without the use of nutritious seafood. Consequently, you will come across yummy seafood recipes, such as the smooth and gentle-tasting ‘salmon with tamarind’, which can help the brain function better. And the immune-boosting ‘oyster pakora with punch and gusto fresh coriander salsa’. Indian Superfood includes classic naans, that have the incredible superfood twist interweaved into their very fabric. For instance the mouth-watering and exotic ‘seaweed and roasted pumpkin seed naan’, where the seaweed is a ‘secret elixir’ for a long and healthy life. There is an abundance of sweets recipes, like the ‘black rice pudding’, which contains metabolism-stimulating selenium. And as to be expected, there are superfood kulfis. The recipes are split into individual sections for breakfast, lunch, dinner and sweets. All of the recipes are easy to prepare, and require only a handful of ingredients that can mostly be found at the local supermarket. Indian Superfood includes invaluable alphabetical directories to all of the superfoods and superspices used in the recipes. The foods and spices included within it are recognised for their exceptional nutritional value by Western science or traditional medicine, and quite often by both. Lovers of vegetarian food are also very well catered to; one prime example being the alternative to saag paneer, ‘baby spinach with tofu’. 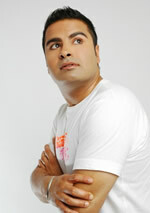 "With the methodology of a scientist and the flair of an artist, Gurpareet brings Indian food bang up to date." "A unique window into the benefits of a truly modern Indian cuisine." "Gurpareet combines a passion for the health benefits of food with an enthusiasm and skill for new flavour combinations, resulting in food that has real flair." 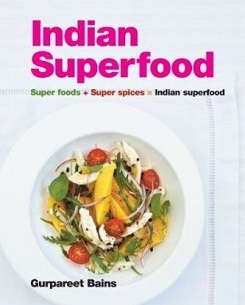 "The Indian Superfood book, is the stocking filler of the year." "Indian Superfood is wonderful - the recipes are truly varied and imaginative."